Stephanie Izard shared this recipe with her guests at the Macy's Culinary Council cooking demo last week. It is actually an amazing dish featured on the menu at her vastly popular restaurant Girl and The Goat. 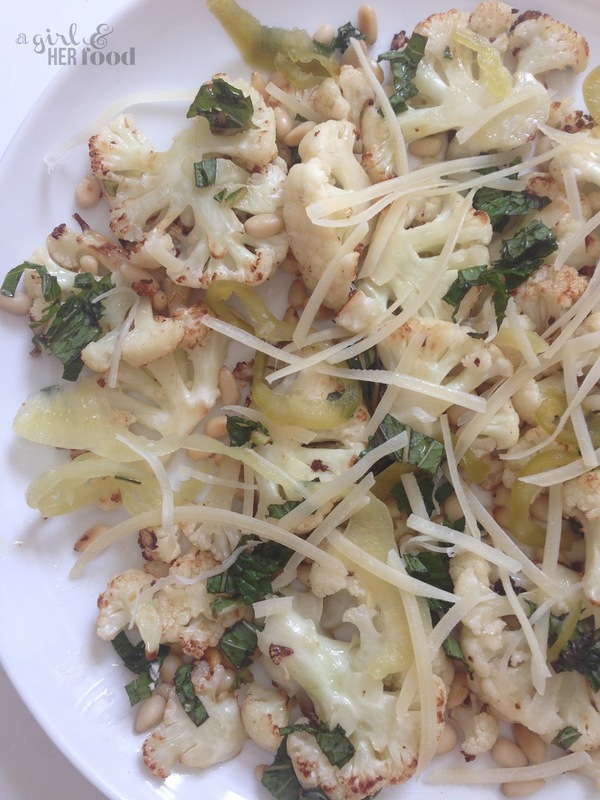 The recipe consists mainly of roasted cauliflower, mint, pine nuts and pickled peppers. 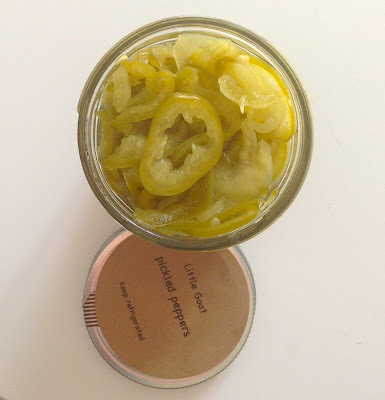 The pickled peppers are so good that after the demonstration I ran over to Little Goat and bought them (they come in a mason jar and cost only $5). Later this week, I plan to get the ingredients and pickle the peppers myself. This is a delicious and filling meal that is perfect for Meat Free Monday. I would recommend it as a main if you are a vegetarian or gluten-free, or as a great side dish for you carnivores. Enjoy! Heat oil in a large skillet. Add cauliflower and cook over high heat until caramelized and soft, 6 minutes. Season with salt and cook an additional 2-3 minutes. Add crunch butter. When melted toss in the mint, pine nuts, and Parmesan. Cook an additional 2 minutes. Plate in a bowl and sprinkle with additional mint, pine nuts, and Parmesan. In a bowl, mash the butter until softened with a fork (or potato masher). Add the remaining ingredients and mix until fully incorporated. In a pot, bring vinegar, salt and sugar to a boil. While still hot, pour the pickling liquid over the peppers. Let cool to room temperature, keeping the peppers submerged in the liquid. When cool, cover and refrigerate. Chef note: in the restaurant we use a Crumber to remove all of the seeds from the peppers to ensure that we keep them whole and not pierce the flesh. You can use a long spoon or a paring knife. Yields 1 quart.